Everyone has heard of the famous Acropolis in Athens, but the Greek term "acropolis" applies to any hilltop fortification that is part of an ancient city. 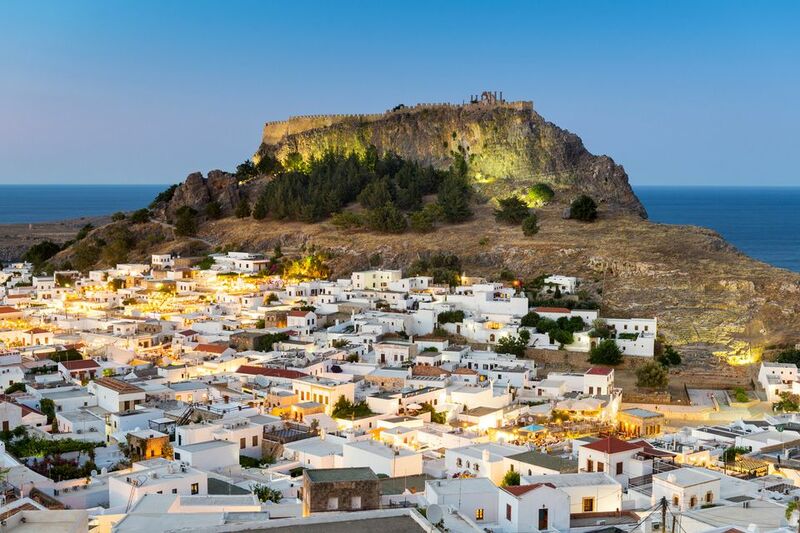 Athens certainly has the most famous acropolis, but the village of Lindos on the Greek island of Rhodes has an impressive acropolis that is one of the country's most important archaeological sites. Lindos is a small town located on the east coast of Rhodes, about 30 miles (an hour's drive) south of the town of Rhodes. The village is exactly what one expects of a Greek town on the Aegean Sea--lots of narrow cobblestone streets, white-washed houses, small shops, and a lovely beach. Travelers with mobility issues may not be able to ascend the ​acropolis at Lindos. It's a 1000-foot climb over an uneven trail from the village up to the edge of the acropolis, followed by a climb up a steep flight of stairs through the fortress when the hikers reach the top. The good news is that there are plenty of shops in the village to occupy the time of those who can't make the climb. Donkeys are usually available to take visitors up to the fortress on the acropolis, but the donkeys can't ascend the stairs at the fortress.